I hope everyone has had a lovely break over Christmas and enjoyed some Family time, as I have. We spent a lovely 5 days with family at Waitarere Beach. The weather was percfect, and there was also the odd sunburn!! Not me, thankfully, blahaha! It certainly put me in the right mood to design my entry for JUST ADD INK this week. The theme - Just Add Summer. The Design Team have come up with some fabulous ideas, yet again, so be sure to go check out the designs and spread some comment love while you are there! Couldn't come up with a catchy title for this blogpost, but I think this comes close! I just love the Grunge Rock Stamp set. I have already used it on the scrapbook page I posted last, but just had to show you a card with it too. This time I brayered my entire background to create the feeling of a room. I stamped the guitar with versamark and Basic Black Ink, added clear embossing powder and heat set it. I then cut it out. I added a shadow where the guitar was going to sit with my sponge and then used a dimensional to adhere my guitar to the card front. This card turned out EXACTLY as I had it in my mindseye. But I really wanted the inside to sing too. I carried the guitar theme through and part of the background from the front of the card. What do you think? I feel this is probably my best card yet. I really don't want to part with it! I have so many photo's of my gorgeous daughter that have not found their way into albums yet. Luckily for me I am finding some gorgeous stamp sets from Stampin' Up! this year which fit so many of photo's I have! I love this photo of her singing her little heart out at Day Care. As soon as I saw the Grunge Rock stamp set, I knew just what I wanted to do. I do admit to partially CASEing the Mini catalogue for this page though. It was too good a layout to pass up! Thats the great thing about our catalogues - they are ideas books too!! If you need some inspiration - break out the catalogue book and have a good look through there - I dare you to! Aren't they gorgeous? Please visit their blogs by clicking on their names, to view more of their lovely work. I would like to wish everyone a very MERRY CHRISTMAS and a happy and posperous NEW YEAR!!! Wow, have I got something gorgeous to share with you today! Alison is one of my regular customers and she recently started her own blog "Confessions of a Stampaholic". I have been so impressed with the designs Alison has been featuring, that I asked her to come up with something I could feature and show you all. Well, Alison outdid herself and I am totally blown away with her project!! I am only going to tease you though, so visit Alison to see the rest of this darling project and leave her some comment love!! I am also delighted to have Ali join my team in the New Year! I can't wait for you to join us Alison, you bring so much fun and enthusiasm to my classes! I thought I would revive the Impossible Box for Christmas! Such a great little box, with the lid all in one. You can see my tutorial post HERE, if you would like to make one yourself! You can also go and visit Lea HERE for the .svg file. Lea is putting together quite a few FREE files for download and wanted to feature mine. I was delighted, to say the least. Please leave Lea some somment love if you do download from her wonderful site - Tu J's and a Taco. I have to confess, I haven't made one of these boxes for a while, and I really don't know why - they are great for putting little gifts in for any occasson and you will never lose the lid!! This is the sort of project you can expect to receive (along with the tutorials) when you join my Stamp Club. Stamp Club will be starting up in February and running once a month until the end of November. Please email ME for more details, but do hurry - I only have four spots left to fill! Now, most of you know how I love to sponge everything! But I have been rather slack lately, well, because, you see - I love Brayering now!!!!! Using a brayer to apply colour to a plain peice of cardstock just makes the colour so intense, much more so than sponging. Don't get me wrong - I still love doing that too. Here is my latest Brayer effort. I would love to know what you think! I have brayered Bashful Blue and Marina Mist along the top and Pink Pirouette along the bottom, I have sponged So Saffron in between the two colour layers to make them blend perfectly. I have also added and insert to this card. I need the insert to be muted so you could see clearly the written message to be added later, so have only sponged the colours on but in the same order as the front. It's my nephew's Birthday next week and I needed ideas for his card - so I have totally CASE'd this from the very talented Jayne Mercer and just put my own spin on it! I needed something for an adult male but I knew I could still use the concept of her fantastic card. You can see Jayne's card HERE, just scroll down to the 13/09/10 entry. I love the combination of Blues and Browns for a guy. For some reason it just says "Manly" to me! I decided to make this card into a gift voucher at the same time and adapted the inide of the card to hold it. You can simply slide the voucher out, write your greeting and then slide it back in! I even pulled out my sponges again to add colour around the edges and subtle shadows on the flags. The finished card! I love how this has turned out. Hope you do too :-) Thanks Jayne for the inspiration! Just a really quick post today showing some of the items that I was selling at the Christmas Craft Fairs I recently participated in. Both were really successful and a lot of fun! Enjoy! All sorts of Poop! Reindeer poop, snowman poop, oh and a repair kit for Rudolph's long trip! Lots of tags for those all important gifts you are giving! Stocking fillers for the kids! And a little something to dress up your Christmas Table. I am asolutely loving the new Summer Mini catalogue! There are so many wonderful new products to tempt and inspire you. I was certainly excited to see some fantastic new designer papers and sets that are perfect for those manly cards. There are also great sets just perfect for scrapbooking too. I have done another 6x6 scrapbook page using the new set "Sentimental Journey". This set was just perfect for the page I had in mind. We took a family holiday a few years ago to Sydney and my daughter got to hand out the lollies on the flight home. She was really excited about this, because she was given a big bag of boiled lollies to take home as a "thank you". I have been holding off putting this photo in an album, because I really wanted to highlight it somehow. I have to say, this page turned out just as I had pictured it! This was such a special photo and I really wanted to do it justice. My daughter was thrilled she got to be a member of the Cabin crew, if only for an hour or so! For the first time, I am delighted to have done a scrap page that I actually love!! Tempting Turqouise is not a colour I have in my range of stock! I had to borrow a scrap off a crafty friend to get this one done! And how to use it with the other colours?! The first thing that sprang to mind was flowers. Okay, a good start, but what kind and what else can I do? The flowers were an idea I have seen around the net and a slightly different version to some I had already done, here. This time instead of a plain circle of cardstock, I used the scallop circle punch, to create the "petals" for each rose. I then punched a smalller circle from the middle of the scallop circle, sniped, and then rolled it up tightly. I stuck them to my card front with a glue dot to hold them nice and secure. I have also added Crystal Effects dew drops to each flower. I layered the posy on Whisper White card stock, which I brayered in Basic Gray first, to get the graduated colour. Once it all came together, I have inserted an extra large Post-it-note pad to make a great little pad for someone to use. Dont' the dew drops look great? Such an easy way to add that little bit of WOW to a project. I think the design team have pulled out all the stops this week. Pop over to the Design Team gallery to take a look at all the gorgeous ideas for your to take inspiration from! I hope you will join in the fun too! SAM POST! Sam makes the most inspiring projects, not only cards and punch Art, but also jewelry! Sam is one very clever lady, so please visit her site and leave her some comment love. I hope you enjoy the next round of Ustamp, Sam. See you there! Now for something a wee bit different! I recently participated in a swap with the Just Add Ink Design Team. Using new product from the recently released Stamp' Up! 2010-2011 Catalogue, it is a great way to get samples of Stamps, colours and Designer Papers that you perhaps don't have yourself. It is also a great way to get gorgeous samples from such talented Artists to dress up my display board! There are 14 stops on our Swap Hop, which are set in a loop so it doesn't matter where you start! All you need to do to follow along is click the Swap Hop button at the end of each post and you will be taken to the next stop. The great part is, you can do this Hop as many times as you want! I decided to do a little 3D item and came up with this wee jotter pad. The bird from the set "Every Moment" really lends itself well to water colouring, which I have done using Ink Pads, SU water colour paper and an Aqua Painter. I have run the backing mat through the Bigshot Polka Dot embossing folder and added a bit of twine for interest. To break up the harsh lines of the cover I have torn one corner of the main image. I hope you have felt inspired to cover your own jotters - they really do make great little gifts. Now go and enjoy the rest of the Design Team swaps and be sure to leave some comment love on your way around! Click on the button below to visit the very talented Mae Collins next! Thanks for stopping by! Don't use just wish you could go on holiday now?! The weather is just stunning at the moment. I have packed my bag, ready to go - wanna see? I have been playing with the new goodies in the Summer Mini catalogue which is out now. If you don't have a copy, then you need to grab one off me!! You can also download a copy by clicking the Catalogue image on the right hand side bar. This catalogue really appealed to me and you will see why when I start sharing the many projects I have been working on. This little suitcase uses the Sentimental Journey stamp set. It also has coordinating DSP. The images and colours (in the DSP) are so suited to Males. Makes gift and card making easy! This suitcase project also fits a 10x14cm stack of cards in it. But I can imagine giving it to someone going on holiday filled with postcards, so they can share their trip with you! If you would like to learn how to make this cute project, then contact me to arrange a class for you and your friends. I am taking bookings for January now! Click on my sidebar blinkie for more information and come join in the fun!! I also have a FREE pass to give away! The give away is a little different this time because I get to give it to someone whom I have never met, but inspires me with their wonderful work. I will be blog surfing over the next couple of days and it could be you!! If you would like the chance to win a FREE pass to Ustamp with Dawn and Friends, get blogging!! Well Lollipop Tree, to be exact!! I thought I would share with you over the next few days, some of the goodies I will have on display and for sale at the various Craft Fairs I will be attending over the next week. Starting with this Lollipop Tree!! I thought it was quite a novel way to sell these wee dressed up Lollipops, and will certainly appeal to kids! There are over 40 Lollipops on this tree, so you can imagine they took some time to make!! I just have to finish the star that goes on top now! I have had Dasher in my stamp collection for a while, and just haven't had much time to play with him. In fact, a friend of mine used him before I did! How sad is that?! Maybe I have too many stamps - NAH! I have chosen Soft Suede as my feature colour and combined it with gold embossing. Both the greeting and Dashers antlers have been embossed, although that is really tricky to photograph to good effect. I have destressed the egdges of the outer most layer of card stock and sponged slightly to darken. The background was stamped with En Francais. On the inside, I have lined with Very Vanilla and stamped just the antlers across the bottom of the insert. I hope I have inspired you to submit an entry yourself! If this doesn't rock your boat then you really must go and see what the rest of the amazing Design Team have come up with this week. Gorgeous work as usual Girls! I recently join a site raising money for a little girl that needs a lot of help - We Stamp for Lara. This site was offrring some wonderful tutorials for a small fee, which is being used to get Lara the specialised equiptment she desperately needs. One of the tutorials I was lucky enough to get is a Christmas Banner - with a difference! Made on a ribbon, these medallions look so great and you could totally coordinate your Christmas colours if you were going with a theme. I have stuck to traditional and simple, but love the overall effect! I have it hanging at my front door (becuase there is nowhere else to put it for now) and the comments I have received about it have been truly wonderful. Once you have the medallions made it comes together so quickly. I think this would also make a lovely gift to give a friend to dress up their doors! I just had to show you this gorgeous Box!! I bought the template from Lauren Meader at My Time Made Easy, and just had to share with you something a little different! Isn't it cute! You could use this box for any occassion! I was just playing around with spare scrap card, but couldn't wait to do a colour one to show this wee baby off! Lauren and her team have the most amazing projects you can buy, and at very cheap (I think!) prices too. What a novel way to give your gifts. I have another template I purchased from her that I am dying to have a go at, but it is just going to have to wait! I have two Craft Markets coming up to prepare for instead! If you would like to see another colourful example, then pop over and visit Jodene Tripp, she has a gorgeous and colourful Christmas version of the same box. Leave her some comment love while you are there! How about something a little different from me? A Scrapbook page!! Yes, I know - I don't normally do them and I certainly don't class myself as a scrapbooker. I recently did a workshop for a lady that would like to learn, so I figured we could learn together! It was a challenge, I must say! But I am pleased with this little 6"x6" layout. I don't own a Dog, but love some of the images you can find, so CASED one off the net. I have a wonderful friend in Delys Cram, whose scrapbook pages are so beautiful! She has taught me the technique of rolling the edges of your card stock, which I used here on the Crumb Cake piece. She also taught me not to fill the entire page, that having space is a good thing! When demoing a scrapbook page, she also recommends putting a photo in, so guests can see how the finished peice might look once they add their own photo. I don't know how to use DSP to great effect, so I used both textured and smooth card stock on this peice instead. I have popped the photo on with dimensionals, so there is a space behind the image to add a journaling tag, if you want one. We used the Soft Holly wheel to roll the backgrounds, and the new Mistletoe Ribbon, which is FREE when you place an order for the Christmas Bundles, see the top of my post for the special. You can order these until the end of the month, so place an order with me before it is too late! I surf the net just about every day for ideas and inspiration, especially when my creativity has up and left me. Thankfully, I still have it at the moment, but that wasn't the case not so long ago. I see so many wonderful artists out there, that I can't help but have a go at one or two projects that they may have done themselves. This card was insired by Danielle Daws, and while not a direct CASE of her work, I love the simpicity and layouts she favours. You can see some of her gorgeous work HERE. It may look a simple card, but uses not only stamps, but ribbon and Designer Paper too, which I just don't use enough of! It is good for me to get back to basics when I feel a little frazzled. 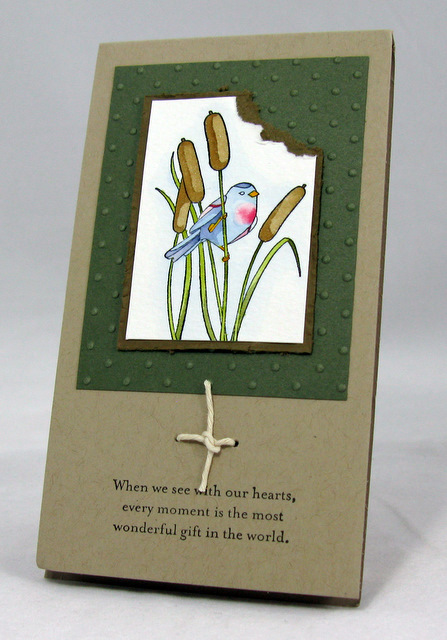 I am really pleased with how this simple card turned out. Thanks for the inspiration, as always, Danielle!! Looking for ideas for your Christmas cards and gift wrapping ideas? Well look no further. 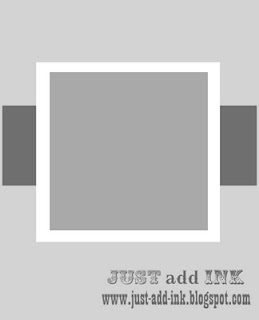 This weeks Just Add Ink challenge is to add Christmas! The girls have come up with some beautiful designs to help you get sorted, so be sure to go have a look at the Design Team entries and those of the participants! I know we don't get snow here in New Zealand for Christmas, although the weather is so crazy at the moment, you just never say never! I see snow scenes and think of Christmas anyway, so ran with that in mind when I made this card. It was also a great excuse to pull out my Brayer again! I have masked the bottom of the card to create the snowy hill and the moon, then brayered over the whole card front in Bashful Blue and Not Quite Navy to create the sky. With the addition of a couple of stamps, making scenes like this is quick and easy. I have also added Dazzling Diamonds along the ridge of the hill to create sparkle on the snow. I decided to let the artwork speak for itself and not add a sentiment for a change. I don't think it needs one for you to work out what kind of card this is, do you?!! You can buy some beautful Tea Light Holders, even from the $2 Shop, but they aren't always exactly what you are looking for. These are so easy to make, that I thought I would have a go myself. Even though we don't get snow in New Zealand at Christmas, I think of snow and Christmas together, so kept with that theme when I whipped this Luminara up. I have used some of my retired stash on this holder, although I have included an Antique Brad from the new range. The iciles I made myself!! Don't they look great?! I also hunted high and low for a battery operated tea light so I wouldn't set the place on fire!! I got this wonderful tutorial from We stamp for Lara. Sign up for the month, and receive a new tutorial every day! This is to raise money for wee Lara Dunn who requires specialist care and equipment. After losing my creativity for a while there, I finally found it again when I turned out this card. I was just playing around again with my brayer and had reieved my latest order with the "Just Believe" stamp set in it. Nothing like a new set to get the creative juices flowing again, right? I pulled out my brayer for this card again. I am starting to feel more confident with it now. I brayered the night sky in varying hues of blue and sponged the bottom of the card in varying greens. I then stamped the silhouette image right over the top. I love the new satin ribbons in the catalogue because they coordinate so well with the ink and card stock colours. They are also beautiful to work with and make bow tying really easy! Can you see the star in the sky? Looks a little loney, I know. But when we lose someone we love, thats exactly how we feel and thats what I wanted to represent. I heat embossed the sentiment in white and finished with a trim on the black mat using the new Scallop Trim Border Punch. I have cut each image and popped them on dimensionals to give it a real 3d feel. The "grass" is a bit of a cheat really. I have taken a stamp from "Just Believe" and using my markers, just inked up the bottom 3rd of the stamp, omitting the flowers that were on there. I have scored a "frame" on the Whisper White card stock, although it is hard to see in this picture and also distressed the edges before layering on a Not Quite Navy card base. Extravaganza was a huge success, thanks to the ladies that attended and to the fabulous team I have in the Paper Diva's. I wanted to show my appreciation to Debi and Rhonda for all the many weeks and hard work that an event like this takes. I love to make pamper packs at the moment, thanks to Debbie Airey and her wondeful ideas for craft shows! After a long day teaching others the joys of papercrafting, I figure my girls earnt the right to be pampered too! I made each of these Tote bags in Richrazzleberry and they are secure closed with gold brads. I recently earnt the Alpha Dies for the Big Shot, and I used these to do their names on each Tote, just to make it really personal for each of them. Inside each one is: A pack of Cleansing Wipes, Shampoo, Conditioner, Hand Lotion and Bath Foam. I also negelcted to mention in my last post, a HUGE congratulations to Sandra who won our gift basket on the day! Sandra is in the front row, on the right, of the group photo, with her basket of goodies at her feet! I hope you have had a chance to have a play with all your new product Sandra! We had fifteen ladies join us for a day of learning projects and techniques, giveaways, a yummy lunch, and best of all, making new crafting friends. My idea of a great day! As each guest arrived, she was greeted at the door by Debi and given her Kit bag for the day. We had a little surpise for each of them on arrival too - A water bottle and sustenance (Chocolate, of course!) all dressed up in a SU Apron and personalised with each guests name! We had four projects to teach during the day. The Paper Diva's took turns to teach each group. Debi teaching her beautiful Scrap Book page. Great to see everyone with such big smiles! Rhonda in a slightly more serious frame of mind. They must have been up to a tricky part in the project! Debi presented a great display during lunch. She showed some of the fantastic ideas you can use the ornament punch for. I know quite a few of the ladies were so taken with her demonstration, they added this versatlie punch to their orders and wishlists! Finally, a group picture! Our wonderful ladies with a selection of their favourite projects of the day! Again, Thank you all for making this such a wonderful experience for such a new team of Demonstrators and we look forward to presenting another Extravaganza in 2011.